I decided to try out Swurl today. They’re the latest newcomer to the Lifestreaming party. Creating an account and getting started has to be one of the quickest, no-nonesense processes I have seen in a Lifestreaming service yet. Heck, they have the signup form right on the home page. You are then presented withÂ a list of their supported services to add to your Lifestream. You can add the services quickly and I like the fact that in most cases they provide details regarding theÂ content that will be imported from the services you add.Â Providing these details are a pet peeve of mine. 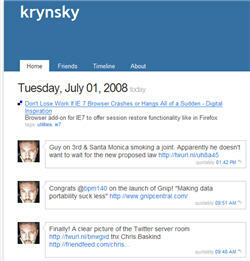 FriendFeed doesÂ a poorÂ job ofÂ doing this,Â while Iminta does by far the best of all services out there. I wrote a very detailed piece about it here. They currently offer 19 services including Blockbuster which I don’t remember being offered anywhere else, not even Profilactic, well…at leastÂ forÂ a few daysÂ until this post goes live.Â They also supportÂ FriendFeed friends, but not content. More on that later. Lastly they don’t offer the ability to import your own feeds. After you’re done adding services you hit a button and boom, you’re taken to your Lifestream page. Right away I noticed that the page looked all to familiar. Being an avid WordPress user I noticed that the design is identical to the defaultÂ K2 theme. From the font used, navigation, and down to the same #3371A3 hex header color! I know totally unimportant and geeky but I thought it would be fun to share. The Lifestream itself aims to provide a slightly stylistic approach to items similar to Tumblr to some degree. But unlike Tumblr, they offer built in commenting on items. I like the larger photo imports and video embeds. Another big plus is importing of my tags for Del.icio.us items. And even thoughÂ allÂ the tag does is link to my Del.icio.us page for said tag,Â I really wish Lifestreaming services supported tagging across all stream items. Next up is the coolest feature and that’s the Friends functionality. Joining a Lifestreaming service with hopes of interacting with other users can be daunting if you don’t already have friends using it. You can feelÂ a bitÂ aprehensive to engage strangers. One of the coolest features of Swurl is that when you visit your friends page for the first time it’s already populated with content from all your friends that itÂ auto-discoveredÂ and imported from the services you added. I believe that’s part of the purpose for adding your FriendFeed account. This is a much better, non-intrusive way that should be used by more services as opposed to asking for your email or any account password for that matter. 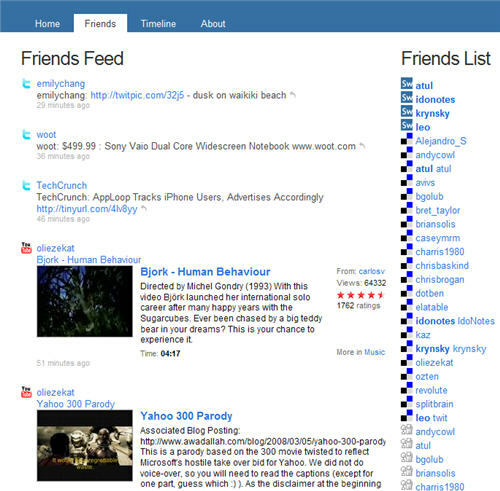 They provide a list that links the usernames for each of your friends to their pages on the respective service.Â This page could benefit greatly from filters by user and/or service as well. But the real kicker is that if any of your imported friends have a Swurl account as well, they automatically follow them for you and provide links to their pagesÂ as well. That’sÂ pretty cool. I even noticd that as I revisited the page I found new friends had recently signed up to Swurl and were automatically added. Of note though is that you can’t comment on items from this view, even if the user has an account on Swurl. You will need to go to their profile page to be able to comment on the item. Â I liked the unique Timeline view. This provides a calendar type view broken down daily by boxes that display items from your stream which includes thumbnails for photos & videos. It also populated boxes with cd covers for songs you liked on Last.fm. Although not a very practical approach for displaying information on a busy timeline, I appreciate the thought. I think a good, clean, functional calendar view would be a great feature addition to any Lifestreaming service and wish more of them would create them. Lastly they offer an about page that provides details on the services that are used to creat the Lifestream along with an editableÂ text boxÂ you can use toÂ provideÂ anything you want. They also offer the ability to provide a replacement header with any image you care to upload. If you decide to check out Swurl, you can find me here. Thanks for the review of Swurl! 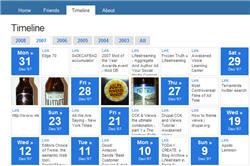 It looks like you really dug into some of our cool features (auto friend discovery, etc). Thanks for your suggestions as well – we are working hard to make Swurl the best aggregator out there.